The Wild used to cause a lot of problems for the Avs. It appears the roles have now been reversed. 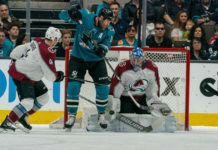 The Avalanche took a 2-1 lead late in the second period and proceeded to step on the throats of the Minnesota Wild, on their way to a 5-1 victory. The win marked the Avs third straight drubbing of the Wild, outscoring them 19-4 in those three games. 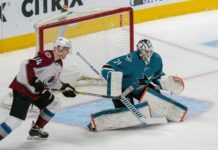 The Avalanche have now moved into a tie for the first Wild Card spot in the Western Conference, giving them a two-point lead on the Anaheim Ducks with a game in hand. It didn’t look like it was going to be an easy game for the Avalanche early. Minnesota came out looking to make a statement, jumping on the Avs with a 9-1 shot advantage early. Semyon Varlamov stood tall, making several strong saves and playing a big role in the Avs killing an early penalty. Before the period would end, J.T. Compher would make a rush up the ice that finished with him emphatically ending his 16-game goalless drought with a beautiful shot over the glove of Devan Dubnyk. The goal would give the Avs a lead into the first intermission. The Avs would continue to give the Wild chances in the second period, but unlike the first, they pushed back themselves and allowed the period to be a little more even. A little over halfway through the first period, Gabriel Landeskog and Nate Prosser would go off for matching minors opening up the ice a little more for some four-on-four action. Soon after, a mistake in the offensive zone by Tyson Barrie gave the Wild an odd-man rush, and Mikko Koivu was able to tie the game up. From that point on, the game was all Avs. Just 59 seconds later, some strong forecheck work by Carl Soderberg and Blake Comeau would lead to Comeau finding a wide open Nikita Zadorov in the slot, and he unleashed a bomb off the post and past Devan Dubnyk to give the Avs the 2-1 lead. The goal would prove to be massive and give the Avs the advantage heading into the third. That’s when Nathan MacKinnon did his thing. Just 11 seconds into the period, MacKinnon took a stretch pass, blew by the Wild defender, and put the puck through Dubnyk’s legs to give the Avs a big 3-1 lead. The Avs would take some penalties in the third, but Semyon Varlamov continued to be a wall in net, and with 13:26 left in the period, J.T. Compher scored his second goal of the game, this time from his knees, and the game was more or less over from there. Tyson Jost added a late power play goal, and the Avs would leave Minnesota with a statement win. The Avs now head to St. Louis, another city that they’ve struggled in recently to take on the Blues. The game starts at 6:00 PM MST on Thursday. The Avs desperately need some secondary scoring down the stretch, and J.T. 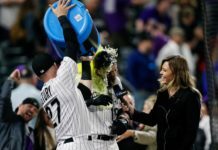 Compher picked a great game to break his slump. The two goals now give him 13 on the season, and he’ll need to keep doing scoring down the stretch for this team to get in. Nikita Zadorov was a menace all over the ice tonight. 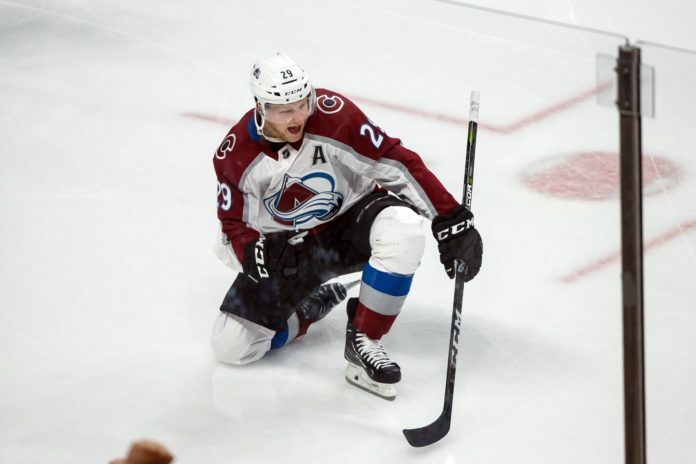 Not only did he score the game-winning goal, but he was an intimidating force all over the ice for the Avs, and has been in every game against the Wild this year. Tyson Jost now has 6 goals in his last 18 games. Over a full season, that’s a 27 goal pace. Carl Soderberg has been a monster for the Avs of late, and that continued tonight. Although he didn’t pick up a point, he played a key role in a few of the Avs goals. Semyon Varlamov was fantastic all night, and with Bernier hurt again, will be playing the bulk of the games down the stretch.